Soak until you can feel your toes again, then head back to start on dinner. Weather not cooperating for the hike you had planned? Keep your cardio streak going with a stop at the fitness center. Keep your suite cozy with a flip of the fireplace switch. French toast, omelets - a day on the mountain calls for more than a bowl of cereal and a banana. 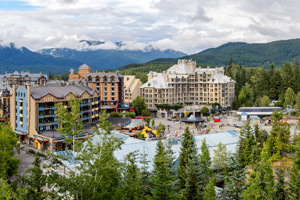 The Whistler and Blackcomb gondolas are just a 5 minute walk from the resort. Stick together in line so you can make the same chair. Souvenir shop-hop through downtown Whistler, a 6 minute walk from the resort. Don't let the weather stop you from enjoying a soak in the hot tub - it's indoors. The resort is a 5 minute drive from Blackcomb Trail. Listen for bird calls. Grab your clubs and go. Whistler Golf Club Driving Range is a 6 minute walk from the resort. Standard, Superior and Deluxe studios with den and loft options, plus one- and two-bedroom suites have all just come off the final phase of a room renovation completed in the spring of 2016. Depending on the suite you choose, you’ll have 400 to nearly 700 square feet of living space, thankfully not overtaken by skis or bikes, thanks to the secure onsite storage area. Well equipped kitchens are pancake breakfast-ready, and have plenty of space for hiding snacks so they don’t disappear the first day. Gather fireside each evening, playing boards games until you spot the little ones yawning. Tuck them in and switch the laundry one last time before heading for your jetted tub, then calling it a night yourself. Whistler Blackcomb has 8,1000 acres of ski and snowboard terrain with over 200 marked trails, 16 alpine bowls, a couple of glaciers, epic terrain parks and plenty of yard sale stories to take home. That said, if you’re wanting to add some new snow sports to your repertoire, try snowshoeing or hit the cross-country trails. Snowmobiling makes a great group outing, and the super-adventuresome may want to give ice climbing a go. The summer season dazzles with beaches and water sports on the five local lakes – plus four championship golf courses, including Big Sky, Fairmont Chateau, Nicklaus North and Whistler Golf Club. The annual Crankworx Mountain Bike Festival may inspire you to grab helmets and try a trail or two. - The minimum check-in age at this property is 21 from May 1 - November 17, 2016. The name on the card used for incidentals, must match the name on the card used for the reservation. The minimum check-in age is 25 over Victoria Day weekend (May 20-23, 2016). For more details, please contact the office using the information on the reservation confirmation received after booking.